The fourth computer-animated film from 20th Century Fox's Blue Sky Studios, Horton Hears a Who tells the story of Horton the Elephant who discovers that the world of Whoville resides on a tiny speck of dust floating by him in the jungle of Nool. The speck was accidentally blown away from its original home, and the Mayor of Whoville enlists Horton's help in finding a new home for the speck before all the jostling it's receiving destroys Whoville. 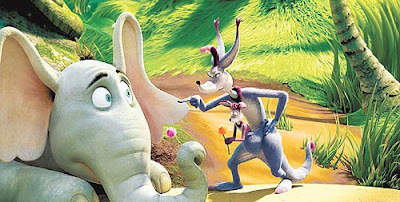 Kangaroo, another Nool resident, tries to stop Horton from his seemingly quixotic journey, worried that he will influence the other jungle dwellers to believe in non-existent things. Jim Carrey as Horton, Steve Carell as the Mayor of Whoville, and Carol Burnett as the mean Kangaroo, are among the well-known voice cast. They do a fantastic job of telling the story at a level that a child can understand while their parents enjoy the humor in it. One of my qualms about the film was the casting of Carrey and to a lesser extent, Carell. While each of these actors are popular and extremely talented and funny, I have found that if they do not have a strong director shaping their performance, left to their own devices they can really ham it up. Recall Carrey as the Grinch in his previous Seuss outing. His characterization of the evil Grinch got old really fast. Happily, I can say that the obvious constraints of animation, one being the fact that much of it is animated before the voicing, gave these fine comedians a relatively short leash to work with, to greater effect in making us laugh. Jimmy Hayward and Steve Martino, the directors of the film do a good job of making the movie appealing to the eye. Frequently, the recent crop of animated movies outside of the Pixar domain, don't always do a great job of keeping the art clean, bright, and attractive. For instance, Shrek seems a little dull, saturation-wise. And another example is the recent Robots , which is so busy and colorful, it is hard to keep focused on the plot. This film strikes a good balance visually, which may be due in part to Hayward's graduating out of the Pixar house of animation. I hope to see other studios benefit from this in the future, as it would be sad to have Pixar be the only game in town. Surprisingly, there is a simplified parable of philosophy to be gleaned from the story. Horton's and Kangaroo's battle is the eternal battle between the believer and the skeptic, faith and reason. At a certain point Kangaroo is trying to dissuade her son Rudy from listening to Horton's ravings. But Horton makes a strong case, asking how the jungle dwellers are sure that they are not similarly living on a speck of dust, while others are observing them. This was the most surreal moment for me. It was at this point when my son turned around and started realizing his surroundings for the first time. He was no longer transported to Whoville by the immense size of the screen. He saw that we were in a room, surrounded by strangers, all experiencing the wonder of a story cast on celluloid, projected onto a wall by a beam of light. In effect, we were gazing at the figurative speck of dust that is Horton Hears a Who. And that is why I got into this line of work to begin with. This entry first appeared on Blogcritics on 3/14/2008.